Today's subject is the game Shadow of the Colossus. In order to talk about it, I'm going to have to make some observations about how critics commonly review games. 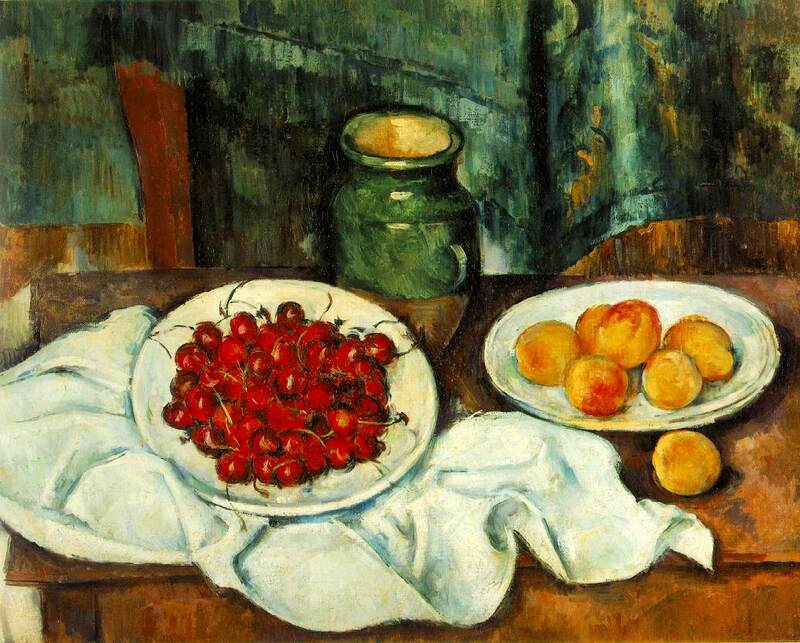 Paul Cezanne's Still Life with Plate of Cherries is a clear evolution from his previous outing in the Still Life series, Apples, Peaches, Pears, and Grapes. The area of the canvas has more than doubled since the previous generation, allowing much finer detail to be discerned. Furthermore, the improved technique used by Cezanne now allows him to depict many more objects on the canvas simultaneously. Unfortunately, Cezanne's rendering technique still leaves a lot to be desired: in particular, the draw distance in his works tends to leave the backgrounds overly blurry, compared to some of the recent releases by Matisse, who somehow manages to squeeze tack-sharp imaging out of the same pigments. The game publishers like this format too, because it gives them an easy target to aim for, particularly when making sequels. Just figure out what games your new product is similar to, and make sure it is a little larger and has better graphics. 95% of the reviews will then say "This is just like [some other game], but bigger and with better graphics," and many of the people who bought the other game will buy your new game without actually stopping to find out if your game is actually any fun. The people whose needs it doesn't serve — at least sometimes — are the players. Or, if we're being crass, the consumers. 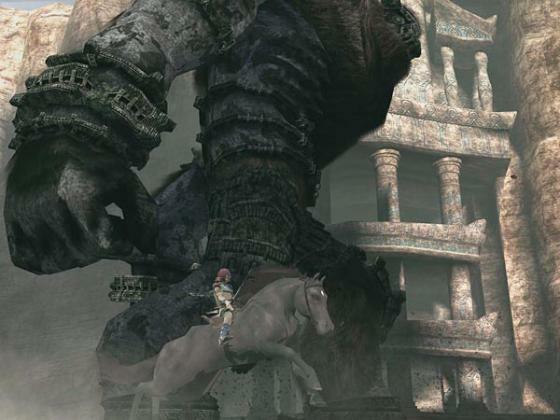 Shadow of the Colossus is a great example of a game where this analytical approach fails. I found, while playing it, that if I focused on any one aspect of the game, that aspect wasn't that good. There's a lot to criticize if you only focus on the details. But when I step back and look at the overall experience of playing the game, I simply have to sit and stare: it's the best game I've played this year. So I want to take what Robert Pirsig, in his book Zen and the Art of Motorcycle Maintenance, calls a "Romantic" perspective on Shadow of the Colossus. I want to talk about it in one piece, rather than by dissecting it until it is a lifeless husk. Written down, it seems puerile. There's no "there," there. It reads like an excuse for a videogame. And yet, and yet, when seen, when experienced, when played, the very sparseness of motivation and character development work in the game's favor. The protagonist — Wanda is his name — is adolescent, not just in appearance, but in attitude. His single-minded focus and his disregard for his own life is something many of us have seen in our darkest moments. He seems to realize the utter futility of his task, and this makes his obdurate refusal to turn back all the more disturbing. This is a dark archetype, and it is communicated through action rather than words. The art of videogames is in its infancy. The medium borrows narrative elements from writing, presentation techniques from cinema, and intellectual aspects from traditional games. Into this mix wanders the player, contributing his will. And as Wanda seeks out colossi and murders them, one by one, the player's complicity binds him tightly to the story. In order to proceed I have to — analytically — explain something very specific about the way the game works.The controls are fairly simple — move left, move right, jump, hit, and a button that basically means "hang on tightly to whatever it is I am on." When thinking about what I was going write about this game, I briefly considered opening with "Shadow of the Colossus is a game whose objective is to keep the 'hang on' button depressed at all times." I have heard it said, as has everyone else, that the game is about combat and "boss battles." This is false. It's also been said that the game is a puzzle game. This is slightly more accurate, but also misses the mark. Shadow of the Colossus is a game about a single moment. The narrative, the scenery, the music, and everything about the game conspire to make that single moment matter. The only thing you — Wanda — can do is try to hang on. Wanda is thrown about like a rag doll, sustained by nothing more than his sheer bloody-mindedness and his refusal to let go. That is the central moment of Shadow of the Colossus. Everything before that moment is a prologue. Everything after that moment is denouement. The moment is stretched out, as you crawl through a Colossus' hair like a head louse, right up until the point that you finally deliver the killing blow. These battles take place within a larger framework whose elements are as carefully composed as an ikebana flower arrangement. The world in which you move is desolate, but not empty. Life exists here, but you have to look carefully to see it. If you're not looking carefully, you won't even see the skittering geckos, the plodding turtles, and the other animals in the game. But they are all there, and their presence is meaningful. The main actors in the game are similarly carefully placed. Discounting the supernatural beings, the number of characters in the game are three. There is Wanda, there is his horse, and there is the dead girl. Without using any dialogue, the game manages to convey complex emotional nuances in the relationships between them. The horse itself has more sensitivity and character than anyone in a David Mamet play. I cared more about that horse than about the entire cast of Halo or Grand Theft Auto. For another perspective, read psu's review of the game. Marketing spin is available at the game's official site. 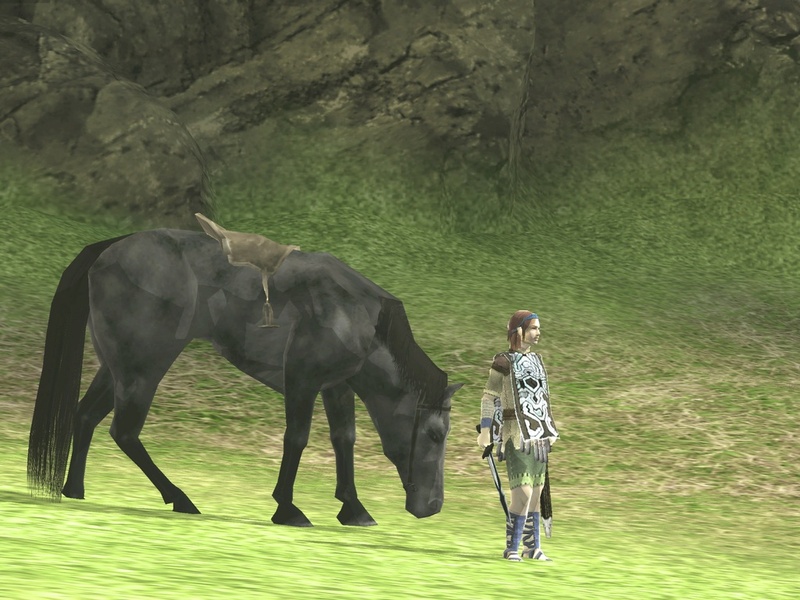 "If you own a PS2 go buy Shadow of the Colossus as soon as you finish reading this review." The European release date has been set as February 2006. I guess that's only three months hence. It'll be easier to be excited about that than the PS3 launch at least. Still, the least you US players can do is fully appreciate the lead times you get over Europe. Some of the games you get, we never get (one of the reasons I got a modchip for my previous PS2 which now, sadly, has gone to console heaven). Did you know that Katamari Damacy never got a European release? That the lead time for Animal Crossing was twelve months? (I gave up and bought Freeloader). We're seriously second class citizens of the world when it comes to release dates. Anyway, I've enjoyed reading that you and psu enjoyed the game. By the time I get it, it will scarcely be worth sharing my opinion. Still, that's global market segmentation in a capitalist context. Wait, NO Katamari Damacy in Europe? At all? Ever? Jesus, I was all jealous about the superb espresso in Rome and that amazine sunlight and those beautiful Roman pines, but now I'm beginning to reconsider. You people are living like goddamn savages. Savages, I tell you! Well, to be fair, we have been promised We Love Katamari... by EA. Yup, EA are enjoying swallowing everything up. When is less certain. Next year, maybe, when everyone is looking the other way. Hence my passionate ranting against regionalisation. The Australian government was savvy enough to spot that Sony's regionalisation was having the effect of limiting the media choice of its citizens, but sadly the rest of the world is slow to catch up. I own a copy of Katamari Damacy (I couldn't live without it) but since my chipped PS2 popped I'm rather stranded. Modchips have been rendered illegal in the UK because of the piracy element - damn the piracy, I just want to circumvent regionalisation. Any legislature which penalises the people and rewards the corporation must certainly lack justice. But now I'm ranting, and in your backyard no less.